WILL FIT THE FOLLOWING MACHINES. 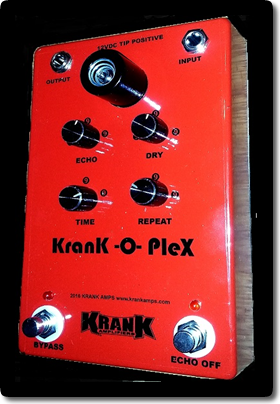 ECHOPLEX EP1, 2, 3, 4 NOT SIREKO. Tubeplex and Fulltone tape echo machine. Made from aluminum NOT plastic. Loaded with NEW ATR tape for long lasting high quality tone. A) ATR tape is SAFE for your machine. B) Its a MYTH that mastering tape is bad for your heads. C) It is the 21st century now and lubricated tape is no longer in production so we are LUCKY to still be able to get brand new high quality recording tape in this day and age. The best part about our new tape cartridge is it's RE LOADABLE. Thats right. 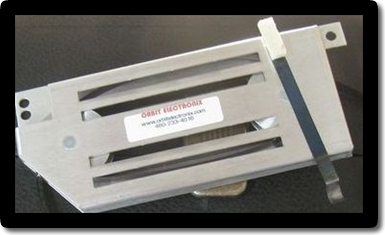 When the tape wears out all you need to do is send it back to Orbit Electronix and we will reload it with brand new tape ($30.00 plus return shipping). This means that THIS cartridge is the ONLY one you need. It can be reloaded with new tape over and over. No more hunting around for new tape cartridges. Echoplex tape carts we got them. 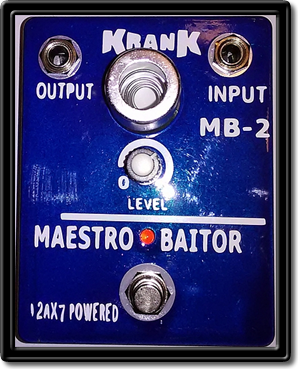 NEW KRANK ANALOG TUBE DELAY. KranK-O-PleX the same features of the psychoplex and them some. You can adjust the dry and the echo levels individually so you can get some clean EP2 tube boost if you like. There are two switches now. One for true bypass like before OR one for just echo off so you can keep the tube sound on at all times. 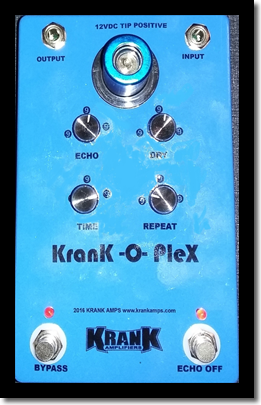 The time control in one one knob so no more long/short delay switch. 580mS 12AX7 preamp tube run on REAL voltage (165 VDC) real deal (BBD) ANALOG DELAY. Only $299.99 plus the shipping ya know. features the ECHOPLEX EP3 TIS58 (NOS) input FET. The main reason why the Echoplex sounds the way it does. 580mS Runs on 9 volts. 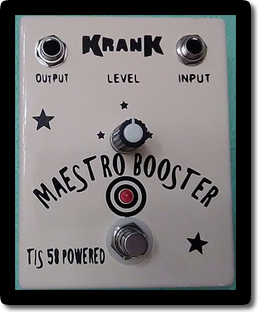 Uses voltage booster to get much deeper tone than your "small" sounding 9 volt only pedal. 1) OURS uses the CORRECT input transistor. A REAL NOS vintage 70s TIS58. 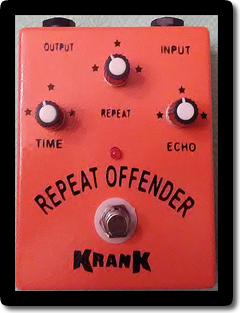 This is a MUST if you want the tone correct. Many builders do not use the correct vintage transistor. 2) Most builders only double the voltage to 18 volts. The REAL EP circuit ran on 22 volts and NOT 18 volts. 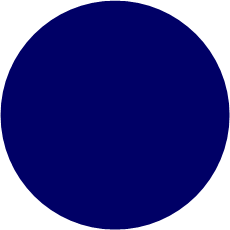 A 9 volt battery is only about 8.1 volts (with load). At best the circuit is running at about 16-17 volts. Thats not 18 or 22 volts. Our booster TRIPLES the 9 volt battery (8.1 volts in real life) and then it is regulated to the CORRECT 22 volts. Much better headroom. 3) Carbon composition resistors (gives it the old school sounding "organic" tone and feel). Poly film caps. 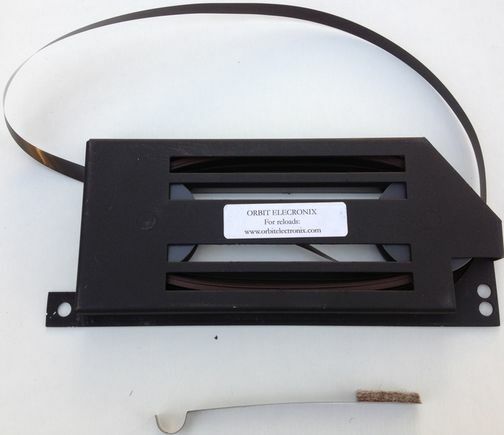 True-Bypass, USA made Switchcraft jacks, FR4 industry standard double sided PCB. ONLY $89.99 plus shipping.